When Chad & Jeremy go out on tour they never know what to expect. Sometimes we get the most pleasant of surprises. One such surprise came from Paula, who rediscovered C&J on their recent trip to the West Coast. 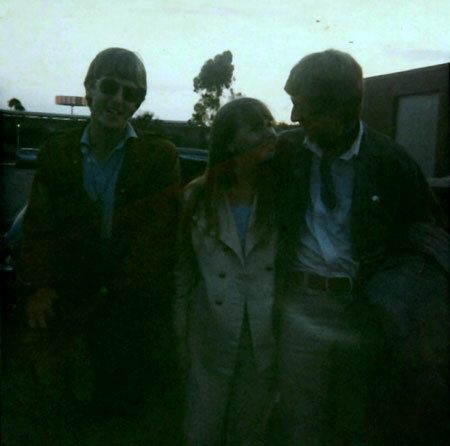 Answering our call for snapshots of any sort, she dutifully dragged down a box from her garage that lay untouched for many a year, and found in it a fascinating glimpse of Chad & Jeremy in July of 1967. To set the scene, C&J are out on a tour of mostly college campuses with in preparation for the autumn release of their epic concept album "Of Cabbages And Kings", which has taken nearly a year to record. Elsewhere, "Sgt. Pepper's Lonely Hearts Club Band" has changed the world, and the Association's "Windy" is about to be blown off of the top of the Billboard Hot 100 by the Doors and "Light My Fire". 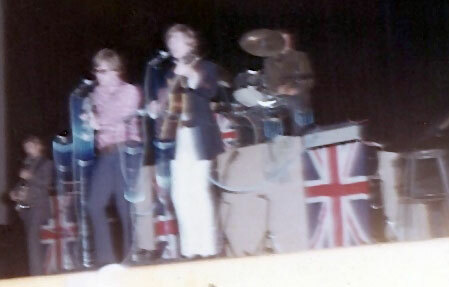 In 1967 the music world and society as a whole was in the midst of a rapidly changing cultural whirlwind, but rather than be left behind as many of the 'first wave' of British groups were, Chad & Jeremy were keen to advance - to 'progress'. These pictures capture C&J in the midst of their own musical transition, with studio recordings and now increasingly television and live work geared towards their new vision (the prime example being the inclusion of the groundbreaking social commentary track "Editorial" from "The Progress Suite" as a standard part of their repertoire several months prior to its release) but with their most recent 'new' record a now year old. They also illustrate the old adage that the more things change, the more they stay the same, especially in the shot of Paula's friend Penny with C&J. In the end, it is the affection and relationship between you and the duo that makes their world go 'round - that love and sense of shared harmony and laughter is what fills the room in a C&J concert, and so it has been for many many years. 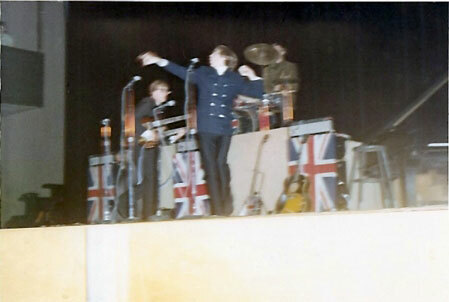 Paula remembers that at this show, probably at Orange Coast College in Costa Mesa, CA, one girl in particular brought a bell and rang it throughout the show. Some artists would have been annoyed, but Jeremy incorporated "The Tinkler" and her bell into the show as a gag - breaking down the barrier between the audience and the artist in order to have a bit of fun. Paula was just barely a teenager then, but she clearly had impeccable taste! All these years later, she's rediscovered C&J, revisited old memories, and started up new ones. And we're glad. Thank you so much for sharing your memories with us Paula. NB. These pictures were not always stored in ideal conditions, and it took a great deal of processing and editing to bring them to you in a viewable form. 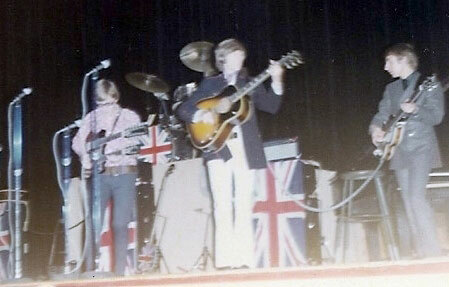 Apologies if your enjoyment is hampered by this - please give us some allowances for the historical nature of these images, as well as the fact that there was no way on earth Paula could have imagined that 40 years on anyone would be interested in her blurry snapshots and personal photos of a pop band! 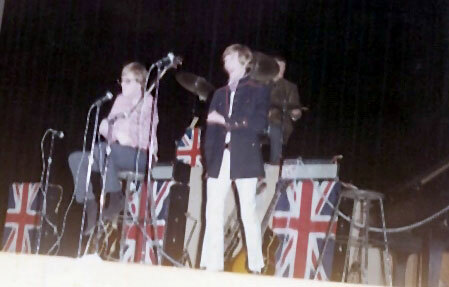 C&J on stage, July 1967. Jeremy clowns around, ringing his imaginary bell at 'The Tinkler'. Getting serious, and getting electric with Chad's famous double necked Gibson guitar. After the intermission, Jeremy jingles towards at 'The Tinkler'. 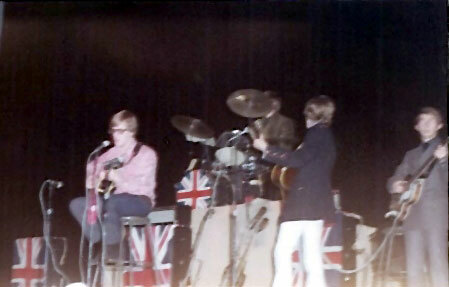 Just like today's concerts, by 1967's Chad & Jeremy Show there was even a piano number or two. Paula's friend Penny meets her teen idols in the most glamorous of settings - a parking lot. 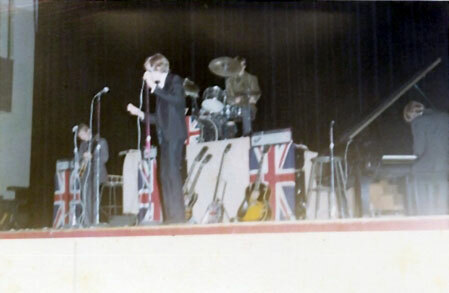 Thanks again to Paula for this blast from the past. 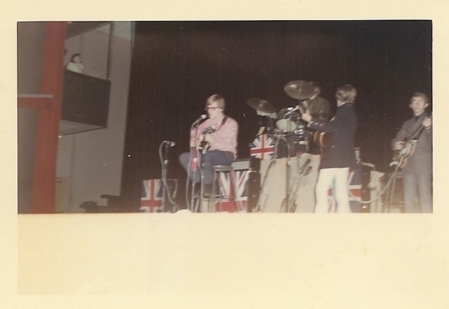 Progress was "suite" for C&J in 1967, but these pictures are yet more proof that sometimes a bit of ARK-eology can be just as sweet several decades down the line. Copyright 2009 Frank Jason Rhoden.